Halloween being my favorite holiday, I thought I’d kick off October with a giveaway. 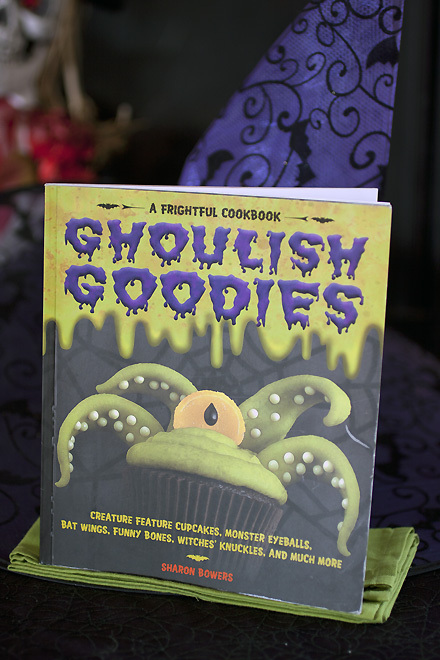 A winner for the totally adorable and doable monster filled cookbook Ghoulish Goodies will be drawn on October 13th. For your part, leave a comment with your favorite Halloween food or recipe. This queso sauce/dip won’t be in there though, but it’s an idea I’ve been meaning to tackle for awhile. My family really likes Qdoba’s queso and I wanted to create a copycat. After a few variations I feel this one is pretty close to the real one, but please let me know what you think. The spooky chips are "Frights Bites Tortilla Chips" from the local grocery store. 1. Place peppers on a hot grill or under a broiler. Blacken the skins on all sides. Place them in a paper bag and roll top down to seal. Set aside until cool to touch, about 30 minutes. Peel off skins and discard seeds and stems. Chop peppers very fine. 2. Add chopped peppers, cooking creme, cheese, tomatoes, garlic powder, onion powder, salt and paprika to a medium size pot and stir over low heat until cheese is melted. 3. Add the cilantro, water and cayenne pepper and stir for another minute or so until it thickens to preference. 4. Turn off heat and serve immediately as a dip or sauce. My favorite halloween treat has got to,be any chocolate. I tend to hid any if i find them in the house. Sigh. Too bad queso really is NOT shippable. I'd really love it if this appeared at my door. This will be my first year making Halloween treats now that my daughter is old enough to enjoy them. 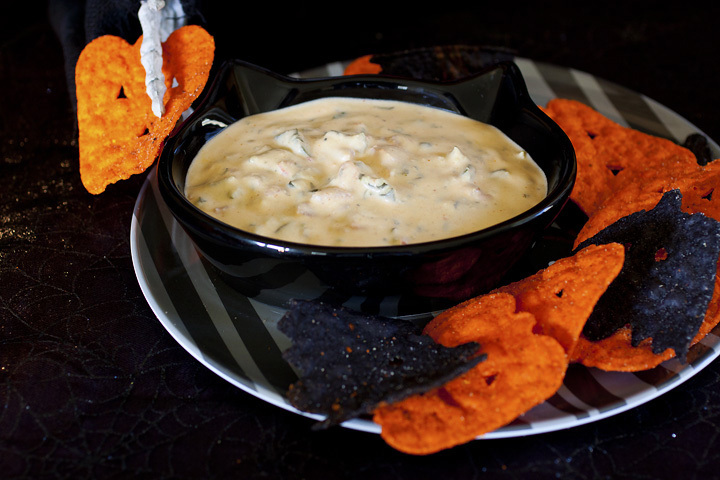 I love the tortilla chips & the dip looks great. MMMM I'll have to try this dip soon! Looks amazing! I love Halloween cut out cookies. This looks great, except for the cilantro (I'm allergic). Thanks! So this is what you've been up to. Love how you took such care in your photos with the decor..
My favorite Halloween food to make? You're making me choose? I have to say it is the different punches with cool shaped ice. Nice giveaway. my kids love the ghost cookies made from Nutter Butter cookies and white frosting. Halloween shaped tortilla chips with various dips, finger sandwiches, mummy dogs, halloween decorated cupcakes. I can't wait for Oct 31!!! last halloween i made black velvet cupcakes with little decorative pumpkins on top for a party. somehow the cupcakes' color didn't turn out quite right (more brown than black), but they were still delicious!